Pine Trees And Pearls: Everybody Get FOOTLOOSE!!!!! This movie was as great the second time around as it was when it first debuted! Someone told me that the second one was like first one but on STEROIDS! Well, as it turns out she was right!!! I loved it!!! Although, I was about 11 years old when the first one came out and never really watched the whole thing. I used to stare at the Kenny Loggins video on MTV from time to time. After seeing the remake last week I am feeling the need to revisit the original!! It's time to break out the air popper and pop some popcorn! Let's all get FOOTLOOSE!! This plaid blouse can say hick or lumberjack. Take your pick. Today I was feeling more hick. But it is fall in Maine, so I fit right in. 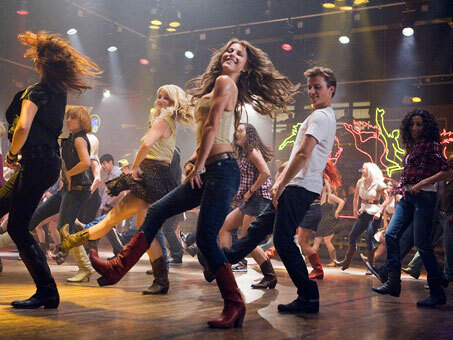 COME ON EVERYBODY GET FOOTLOOSE WITH ME!! I haven't seen the film yet but it looks good! Great post!